PARTS: Part included with door weatherstrip. Item 9 in the assembly drawing image on this page corresponds to Mazda OEM part number F152-58-762. 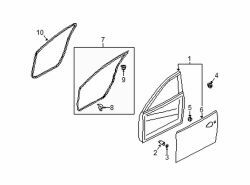 This Mazda 6 Left Door w'strip clip is a 100% genuine OEM replacement part shipped directly to you from our Mazda dealership. Genuine Mazda replacement parts are backed by the manufacturer's warranty. And that's all we sell on this website, all at discount pricing. Why buy from Mazda Stuff? Confidence: All of our factory original OEM Mazda parts are shipped directly to you by an authorized Mazda dealer. Quality: We only sell genuine OEM Mazda parts and accessories, the manufacturers recommended replacement parts that are engineered for your specific model.